The Campsite Award is an industry award for camping entrepreneurs. 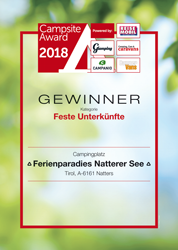 We present the popular award to our readers of the magazines “Reisemobil International”, “Camping, Cars & Caravans”, “CamperVans” and “Glamping” and animate them to vote on your campsites. In addition, your campsite will be presented online on this website. As a campsite operator, you can participate for free and take home the popular award as a winner. The top 3 of each category will receive a framed certificate which you can exhibit at your campsite. All the winners of Campsite Award will be published on our website and in our print media additionally. By publishing a press release, we ensure nationwide recognition. To participate, please fill in our entry form. Therefore you, as a campsite owner, are kindly asked to create sententiously descriptions to present your campsite to the jury, which consists our readers your guests. Apply now via our online form! 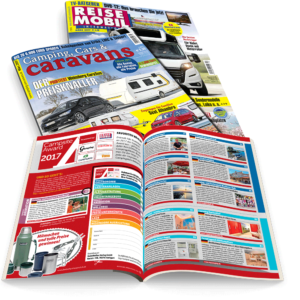 The judges panel consists of readers of the magazines “Reisemobil International”, “Camping, Cars & Caravans”, “CamperVans” and “Glamping” as well as your guests. This ensures the evaluation assessment by independent camping enthusiasts. A self developed specified procedure allows comparability and fairness in the competition. Thereby campsites with a small number of plots will also have the chance to win the Campsite Award. Find out more about the jury! Our prices are transparent, there are no recurrent costs. Participation in the Campsite Award is free. Only when when ranking under the Top 3 of a category, the purchase of a winner’s package is obligatory. More details can be found here .